Adam Beyer, Ben Klock, Chris Liebing, Dixon, Jamie Jones, Joseph Capriati, Laurent Garnier – I could go on. Time Warp's 2018 lineup has dropped a little later than normal, but the list of techno heavyweights is just as long as ever. 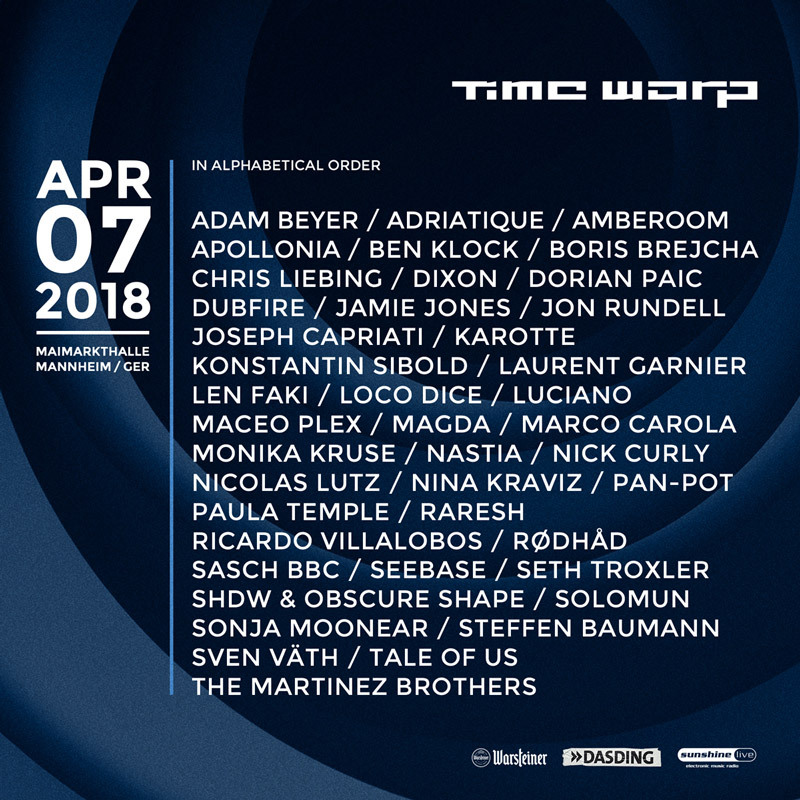 Boris Brejcha, Len Faki, Loco Dice, Luciano, Maceo Plex, Marco Carola, Nina Kraviz, Pan-Pot, Ricardo Villalobos, Rødhåd, Seth Troxler, Solomun, Sven Väth, Tale of Us and The Martinez Brothers are also among the names that jump out and confirm Time Warp's reputation as reliable purveyors of a top-line underground party. Mannheim's epic Maimarkthalle packs it all into 6 distinct rooms, with sets starting at around 20:00 and finishing early Sunday afternoon. Old-hand Chris Liebing had already been confirmed for the Time Warp Pre-Party at Ludwigshafen's Loft Club on Friday 6 April, the night before the real thing kicks off just a few miles away. Ludgwigshafen is a city directly across the Rhine from Mannhiem. One talking point will be the gender make-up of the lineup. 6 female artists will be at this year's edition – Magda, Monika Kruse, Nastia, Kraviz, Paula Temple, and Sonja Moonear – accounting for 14% of the total lineup. This is a slight increase on last year, where Kruse, Kraviz and Moonear were among 5 female artists who made up 12% of the lineup. See this year's full announcement below, and book Time Warp DE 2018 tickets here.